Easton Walled Gardens Show.. Thanks to all! All so true. I was delighted that everyone had worked so hard and showed so many different aspects of creativity, From ceramics and glass to sketchbooks, prints and books to fine original paintings. So, many thanks to Sue and Sue, Tony and Ian, Jane and Joan. Linda and Linda and Lizzie and Lucy… and of course to everyone at Easton for making it all possible. We are already thinking about next year! I now have to knock the chaotic house and unruly garden into some sort of shape, then a break in Scotland. As soon as we are back I am off to Twigworth to be Artist in Residence from Sep 24 – 29 at wonderful Nature in Art.. home of some of the best Natural History Art in the world. Come and say hello if you happen to be nearby. Hopefully back to serious blogging in October! I have said before, if the blog is quiet it’s because my life is not. How true. Just two weeks before our Easton Group Show and I am looking at the pile of “stuff”, sketches, prints, half started paintings. etc. What to do with all this? I have regarded this year as one of experimentation, I have researched, studied, thought and made many, many sketches and notes, more than I could ever put on the blog. It’s been a year to meet other artists and share ideas and to explore some new directions. It has been illuminating. So for me the Easton Show will be a sort of marker, the end of one phase and the beginning of the next. With a very exciting solo show at Easton arranged for a years time, it’s on with forward planning and a few changes in what I do and how I work. Number one on my list will be my delayed side step into printmaking. I now have my lovely small Rollaco Press, my big old Cropper Charlton nipping press and a little old Adana housed in the garage and we are ready to go. The big old nipping press with my much prized Boxcar Press apron. I had been exploring letterpress again when I was in Orlando with the very excellent guys at Mamas Sauce whose enthusiasm and dedication to all things printy was so inspiring. Although we are not there anymore I still keep up with what they are doing. See their site for some wonderful printmaking, links and videos. St Brides Foundation London Print Museum and Courses. And a hopeful trip to the USA to the fabulous Hamilton Wood Type and Printing Museum next year. There will be making small books, inspirational prints and maybe a ranting broadside or two. So adventures with lino and the press started just this week with a very simple bee! (what else). 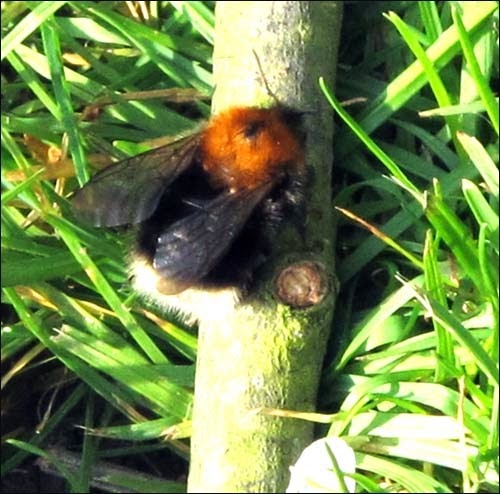 The huge new queen Bombus terrestris are out and about. They were my inspiration and I may call her the “Easton Bee” in tribute! And in other colours too! Image 6x4”reduction print on Hosho paper. I really do intend ( Yes ..I do know all about hells road..but a girl has to try) to get back to the blog with a perhaps a bit of a printy make over for that too.